A New Jersey transit officer is being hailed as a hero after he put his life on the line to pull a stranger off the tracks. 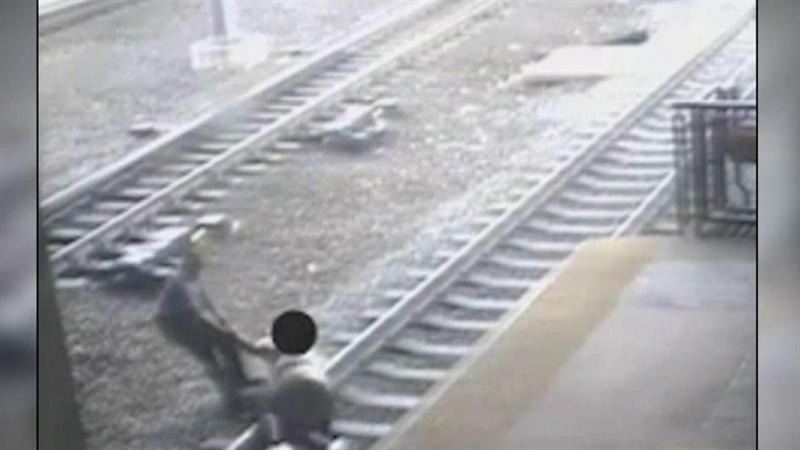 Victor Ortiz made a split-second decision after he saw a man laying on the tracks — and the headlights of a train quickly approaching. "I was bracing for the worst, you know, but hoping for the best," he said in a report that aired on TODAY Monday. "In my mind I was like, this is not going to happen, not while I'm here. I'm going to do what I can to pull this guy through." Video footage of the daring rescue shows Ortiz struggled with the man, who was significantly larger and didn't want to budge. But Ortiz somehow found the strength to pull him off the tracks, with only a second or two to spare. Ortiz is now being hailed as a hero. But the officer said he hopes others would have done the same. "Had I just stood there and done nothing, again, I wouldn't be able to bear that thought in my mind," he said. Ortiz said the man on the tracks later apologized and thanked him. "He goes, 'I didn't mean to do what I did,' and I told him at that point, well, that's my job," he said. "My job is to protect and serve." Ortiz currently is on a well-deserved (and pre-planned) vacation.